We are proud to be hosting our inaugural Clitheroe FC Comedy Night at Shawbridge. Two stand-up comedians from the international comedy circuit will be joining us all for just £10 a ticket! Whether you're a couple or a group, our Friday night comedy show will be a great way to start the weekend. The night will be hosted by Lewis ‘Big Lou’ Jones, a favourite on the comedy circuit since he burst on to the scene back in 2010. Another product of the legendary comedy writer Ashley Boroda’s comedy course, the Manchester born comic announced himself on to the comedy scene by winning the Lass O’Gowrie New Comedian Of The Year competition. Lou will be joined by Australian comedian Ray Crawford who has featured at every comedy house in Australia, as well as the Comedy Store in LA and multiple TV and radio appearances. Seasoned headline Sully O’Sullivan will also be on stage. The Kiwi in exile has performed all over the world after shooting to fame on New Zealand’s cult comedy program Pulp Comedy. Our doors will open at 7.00pm, so you will have plenty of time to have a drink in our clubhouse before the show starts at around 8pm. Tickets are priced at £10 and are available to purchase on matchdays against Runcorn Linnets (16th Feb), and Chasetown (2nd March), or can be bought at Banana News in Clitheroe town centre. 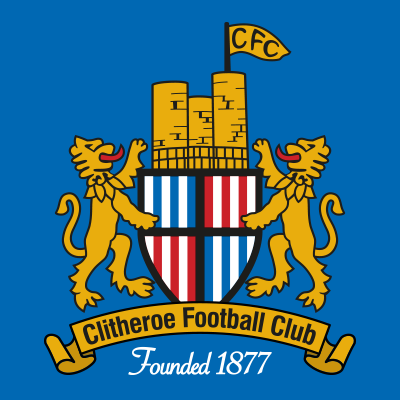 You can also message us on Facebook and Twitter, or email us at clitheroefc@hotmail.com. We look forward to seeing you, and hope it’s the first of many.